Who doesn’t love a tub of hummus with some dips to tuck into while you’re waiting for dinner, or to spread into a sandwich to make it extra tasty. If you have got any kind of food processor, hand blender, or smoothie maker, you can make your own hummus in 5 minutes for half the cost and calories of a supermarket tub, with twice the amount and twice the taste. What’s even better about this is that it is great to freeze in tubs so you can blitz up a big batch to defrost as and when you need it. You are under 5 minutes away from your own delicious healthy hummus with our totally simple totally delicious recipe. Pile the chickpeas, tahini, garlic, salt, pepper and lemon juice in your processor. If you have time, roasting the garlic cloves whole in their skins in a low oven will give your hummus a lovely mellow flavour, and you could also give your chickpeas a few minutes in a dry pan to improve their texture. Also add the lemon zest, spices and herbs if you are using them. 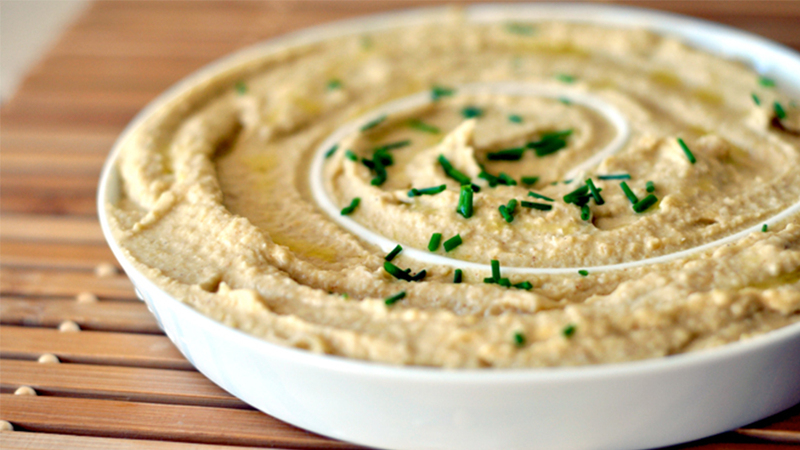 Start mixing the hummus, adding the oil gradually until you get the consistency you’re after. This is kind of up to you- some people like really thick chunky hummus, others like it completely smooth. Once you’re happy, give it a taste and you’re done! Serve it up with a plate of delicious crudites and a sprinkle of paprika on top.